Writing as a duo is rather unusual: prior to coming across Gert Loveday’s Writing is Easy the only other example I knew of was M. Barnard Eldershaw, which was the pseudonym of Marjorie Barnard (1897–1987) and Flora Eldershaw (1897–1956), who together wrote five novels (including A House is Built which is on my TBR). Gert Loveday is the pseudonym of sisters Joan Kerr and Gabrielle Daly and you can read about their writing process in Guy’s interview at His Futile Preoccupations. (Where you’ll also see that Nicci French is a writing duo too, who knew?) Anyway, it was Guy’s review of Writing is Easy that made me buy a copy, and it is fair to say that this novel at hand on the kindle has helped keep me smiling over some very trying days recently. Let’s just say that lately I have had to spend a lot of time waiting to be seen by assorted bureaucrats, and even more time waiting on the phone to speak to other assorted bureaucrats. 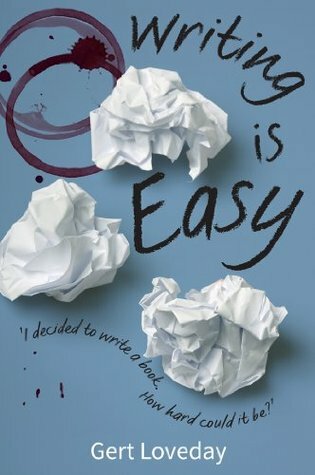 Writing is Easy is, as Guy so reliably said, a very funny novel about a writers’ workshop held in a rural retreat. There are two completely incompatible and mutually hostile ‘mentors’: Lilian Bracegirdle who writes incomprehensible performance ‘poetry’ and Marcus Goddard, a hack writer of slush fiction. Neither of them could maintain their posturing without their respective amanuenses Marjorie and Lester, both of whom are fed up with being treated like dirt and are thus tempted towards using their inside knowledge as blackmail. I shall say no more about the plot! The hopefuls are a motley bunch. Rex Random writes ‘gritty’ detective novels channelling Raymond Chandler, and John Brow is a fitness nut who wants to sell his bizarre fitness regime to the world. Desma Brooks is writing, yes, you guessed it, a family history; Marilyn Boots is writing out her fantasies of the happy marriage she doesn’t have; and Helen West is a professional applicant for writing grants who seems not to write anything at all. The venue for the calamities that will have you chuckling is a country house managed by husband-and-wife duo Andrew, who is more than a bit precious about his menus and his gourmet meals, and Mandy who panders to his creative genius. The sole voice of normality is Janie, who’s there on work experience and provides a wide-eyed but candid commentary for her mum back at home. The novel pokes fun at all sorts of things: the pretentiousness of writing; the marketable rubbishy best-seller and the unmarketable literary novel that no one understands (do I detect elements of Beckett’s Worstward Ho in Lilian’s work? ); the belief that anyone can be a writer; the indefatigable family historian; and of course the idea that writing can be taught at all. If you need a bit of cheering up, or you just want a playful satire for the fun of it, Writing is Easy is ideal. OK, you’ve convinced me. Purchasing it now. How utterly delicious this sounds! I’ve had this on my kindle for a couple of years and hope to get to it one day … I’ve seen them commenting on blogs around the traps. Another Australian pair from around the Barnard Eldershaw period is Dymphna Cusack and Florence James who wrote Come in spinner. Another collaborative work I’ve read is Crown of Columbus by then husband and wife, Louise Erdrich (Native American writer) and Michael Dorris. BTW You’ve seemed a little quiet the last few days. Was wondering if it were to do with your father. Good luck. *wry smile* You are an observant friend! *smacks forehead* I should have remembered Cusack and James, I’ve read Come In Spinner! Oh, I forget things like that all the time. People ask about books that deal with this, or that have that in them, and I’m sure I’ve read some but can I usually remember? Not on your Nellie. Thanks for this, I’ve just checked at Zportal and you are right. I won’t order it now because I’ve already got more library books out than I’ve got time to read, but I’ll add it to my wishlist at Goodreads so I don’t forget it. 2. What is ‘slush fiction’? 3. Sounds interesting but is it in itself a literary piece? Doesn’t sound it. What’s the style… Quite commercial? Ha ha, I’ve actually read something by Nicci French but that was back in my pre-Google days when I knew nothing about authors except what was on the book blurb. Slush fiction is a term that I may have made up myself. It means books with BIG gold lettering on the cover, that should have stayed in the slush pile. The style, hmm, I’m not sure. There are jokes and allusions that only litfic readers will ‘get’ but it is a light-hearted, playful farce. I could see it being made into an ABC comic mini-series, (if they had any money, which *sigh* of course they don’t) but I don’t think it would lure the commercial stations. French sisters Liliane Korb and Laurence Lefevre write mysteries set in Paris under the name Claude Izner. We’re so glad you read and liked this,Lisa. And for Jenny above, one of our reviewers said “you may never feel the same way about T.S.Eliot again.” So, no, unlikely to be of interest to a commercial film-maker. This whole topic of writing duos deserves a Whispering Gums post, doesn’t it? Or has Sue already written one? Don’t forget we have two more, if you’re in the mood for Tennyson, Blake and cake, or the Norse sagas and reality TV. Ha ha, I think I’d better read my Norse sagas first before I try yours! But … I could feature you two as my first and only duo in Meet an Aussie Author, if you’d like to? Haha, I was thinking that myself Lisa. I’ve done literary couples – which included collaborators but I think I might do one on just the collaborators. Re some of the names proposed here. I created a LITERARY COLLABORATORS category but someone has changed that and Wikipedia has now split them into two: Collective Pseudonyms for those who use pseudonyms and Writing Duos for them all. Some of the names people have suggested here only have individual entries in Wikipedia, rather than a joint page which would then get a category. Yes it does, and yes I know what you mean. Once you start with WP it becomes never-ending IMO. I was about to mention them. And there’s also Boileau-Narcejac. – Adolfo Bioy Casares and Slivina Ocampo – they wrote a spoof crime novella called ‘Where There’s Love, There’s Hate’, which I reviewed a year or so ago. – Maj Sjowall and Per Wahloo, authors of the Martin Beck detective novels. I don’t see either of those in Sue’s Collective Pseudonyms Wikipedia page, though there are 89 listed – it’s obviously more common than I thought. Sounds like a fun read; since I am following and enjoying Gert’s blog I intend to give it a try. As for collective pseudonyms, I can contribute H. Bustos Domecq, Ellery Queen, Lars Kepler, Iny Lorentz, Erckmann-Chatrian and in the field of non-fiction Nicolas Bourbaki. Yikes, I reckon we’ve got six months’ reading ahead of us if we try to track down all these duos! And I thought it was a rarity!! Lisa, you got me when you said it keeps you smiling:) And of course because it’s about aspiring writers and a writing workshop – have been to plenty of them. He writes a tempting review, does Guy!